For more than 40 years International Dog shows have been held in Umag, in a small Istrian coastal town in the north of the Croatian Adriatic coast. Every year in June Umag is a host for a double CACIB show held in the city park. Beautiful and warm sea, plenty of sunshine and excellent accommodation attract exhibitors, bringing the total of entries to 1,100 dogs from 20 countries. 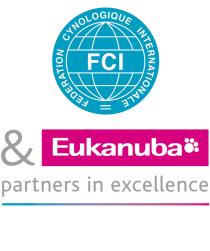 The Croatian canine organisation was honoured to have as one of the judges the newly elected FCI President Mr Rafael de Santiago, hosted by the President of the Croatian canine organisation Mr Damir Skok. The surprise of the show was the double Best In Show winner, the Saluki Del Borghini Oscar della Renta from Italy, as he was last year’s show winner in Umag as well.